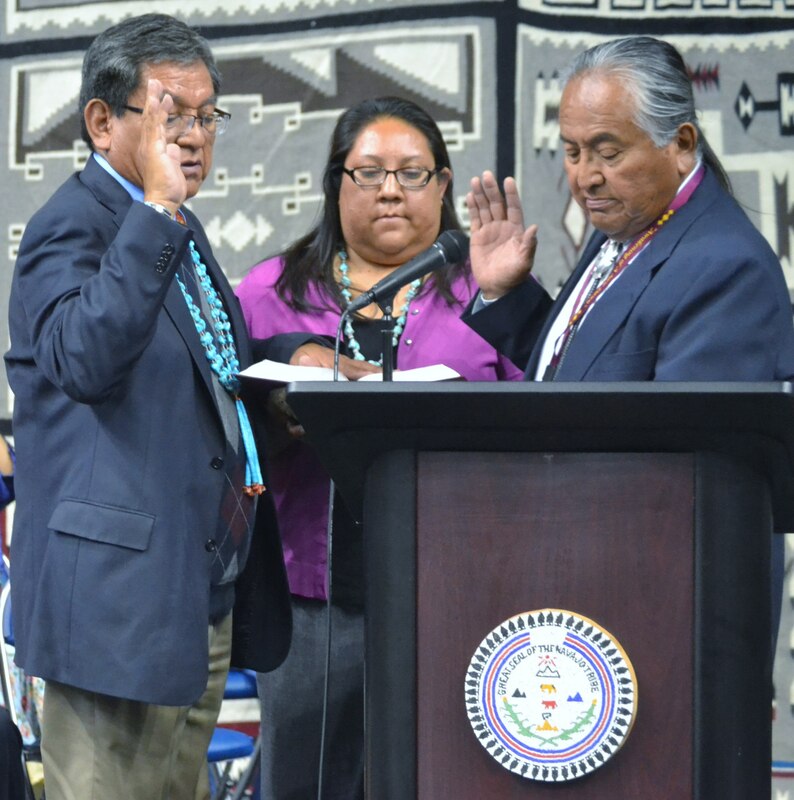 The Navajo Nation Judicial Branch announced in a press release on May 13 that Supreme Court Chief Justice Herb Yazzie was retiring and that his retirement was effective at 5 p.m. on Friday, May 15, 2015. Yazzie added, “Our society is a precious one, but one in which isolation and lack of self-esteem can harm our young ones their whole lives. I was such a young one, refusing to see value in myself, yet I survived though many of my generation did not make it and could not provide for the families they left behind. Somehow, I gained experience and knowledge, and was able to reconnect with my loved ones. “It is much harder for a young person to reconnect after isolating himself or herself than to understand the value of relationships, k’é, from the beginning and be helped forward. Sometimes to learn this value, there must be a disciplinarian. I have tried to emphasize this value in my participation on the Supreme Court, Hashkééjí Nahatʹá, and by example,” he stated. “We start with incomplete knowledge in a difficult environment. The difficulties in making ends meet is often unbearable enough and becoming separate from our value system, embodied by our language, can seem insignificant. We can become indoctrinated into believing such identity to be unimportant. Parents may even believe that they are protecting their child by affirming the unimportance of traditional knowledge that the parents, themselves, have not conveyed,” Yazzie stated. Yazzie stated, “The other day, someone told me that he understands and supports the Supreme Court. He remembered that when the Council declared that Fundamental Law and tradition is only what the Council decreed Fundamental Law to be, it was the Supreme Court that struck down that effort. “It was through use of Fundamental Law that the courts were able to rein in corruption in past Councils and strike down enactments that provided cover for embezzlement of the discretionary fund,” he recalled. Yazzie explained, “Concern for the traditional law of the people and the value system of the people have been the duty of the court system since the Navajo Nation began performing decision-making functions free of the burden of elections. “It is my steadfast hope that the Judicial Branch may continue to be the disciplinarian and gatekeeper without interference,” he stated. “The Court takes a comprehensive look at the laws and hears the explanation from those who wish to state their position. The Court cannot ignore other laws, and it cannot pick and choose which law applies when there is a set of laws that all bear on one subject,” Yazzie stated. He recalled, “In the recent election cases, our courts affirmed the rights of the people to choose their leaders. Yet at the same time, it was our elders, our former leaders, who made it very specific, very strong, that you must be fluent in order to be President and Vice President. “Our government specifically added the fluency qualification in 1999. We affirmed the validity of the language requirement in our president election laws. We have noted that the President is nihi nanitʹaʹi elected by all the Navajo People while all other offices are elected by communities in smaller areas,” he explained. “In closing,” he stated, “I would say that the recent proposed measure to remove me all concern decisions by the Supreme Court, not actions of an individual. The decisions were based on a thorough analysis of the law and declaration of how the law should be applied. Issuing court decisions that are thoroughly explained are manifestly judicial acts, that is what courts do. “Our past governmental leaders have always said that when the Supreme Court makes a decision, that is the final decision. That law must be complied with no matter how some may view me as an individual,” Yazzie stated. “I am truly grateful for being able to have worked with all of you. I have become acquainted with many of you personally and know that I have family all over our land,” he stated. harshness of life, that we will help them, especially affirm to the Diné that because we are Diné, we can restore ourselves to the Beauty Way, and thereby also affirm all humanity who are universally linked, as neighbors, as surrogate family, and as partners in a mutual journey. I’m sure we’ll see each other soon,” Yazzie stated. The Judicial Branch also stated in its press release that Chief Justice Yazzie has served as the chief justice of the Navajo Nation since April 21, 2005. He has also served as the Legislative Branch’s Chief Legislative Counsel and as the Navajo Nation Attorney General in 1990 and from 1993 to 1998. He is a 1975 graduate of Arizona State University College of Law and a member of the Utah State Bar and the Navajo Nation Bar Association. Chief Justice Yazzie is also a veteran of the U.S. Army. The Judicial Branch thanks Chief Justice Yazzie for his years of public service and dedication to the Navajo Nation and the Navajo people. This entry was posted in News Articles, Professional Journal and tagged Chief Justice Herb Yazzie, Judicial Branch, Navajo, Navajo language, Navajo Nation, Navajo Nation Council, Navajo Nation Supreme Court by Marley Shebala. Bookmark the permalink.